Legion, I'm waiting for your explanation of Bortles' game yesterday. Also, will the real Allen Robinson please stand up? I'm just scared the NFL will think more offense is the solution to these awful games and the decline in ratings..
Just imagine even more pass interference and defensive holding calls. You could hear the delight in Collinsworth's voice after that last yoink. We're free! We get to go home now! That game was both a horror show and the nightmares I have about having to watch a Browns intramural game. Offensive coordinator Greg Olson was a Raiders sleeper agent this entire time. Also, not enough of the game was in the 4th quarter. They need to figure out how to make more of the game be 4th quarter for Bortles. The most brutal part of that game was in the 4th, with the Raiders punting on 4th and 24. The snap goes into the ground, the Raiders punter picks it up... and runs for 27 yards and the first down. Leading to the TD that put the game out of reach. Courtesy of CBS Sports, some fun facts about last night's tie. This was the first tie without a touchdown since 1972, when the Eagles and Cardinals tied 6-6. The Seahawks had five first downs in regulation -- all of regulation -- which would have been the lowest first-down total of the season. There have been 3 games this season with fewer than 10 points scored in the first 3 quarters. All 3 involved the Seahawks. Cardinals involved in the last 2 ties without TDs. Time to ban them from the league. It's Cards-Panthers this week. I'm thinking 3-3 sounds around right. Second choice: 2-0. Bucs beat the 49ers. A little something to be happy about this year! Based on yesterday's game, I think you'd have to say the 49ers made the right decision in benching Kaepernick for Blaine Gabbert. That statement is a compliment to no one. I have to say that, as a Seahawks fan, the game was freaking unnecessarily stressful. The first 3 quarters were groan-inducing, but the ending was a nail-bitter. It's somewhat fitting that it ended up tied. I can totally see why the game would have been boring to the point of annoyance for anybody other than 'Hawks/Card's fans though. Nonsense. That's some of the best quarterbacking the 49ers have had all year. We could talk about Aguayo's FG percentage climbing up to 54.5%! In addition to the one he missed, he doinked an XP off the right upright, but lucky for him, it fell on the "good" site of the crossbar when it came down. 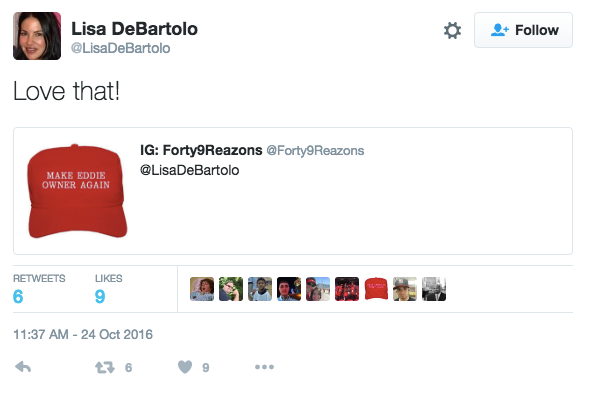 Lisa DeBartolo has been taking some Twitter snipes at cousin Jed. It's good. You can snipe all you want but...scoreboard baby. I wonder how long Siemian will hold off Paxton Lynch. I get that it was an ugly as hell pass, but how can that be a fumble? Check out the apt sponsor. I think they remember how poorly Lynch played in his one start. It'll be a while. Goff to get more reps with 1st team during the bye week. Jeff Fisher is downplaying it a bit by saying Case Keenum doesn't need the extra reps, so he's going to get some days off and that's when Jared Goff will pick up some extra reps. Still, gotta be good news for Goff. I firmly, firmly believe in Blake Bortles. Without a doubt. Robinson said benching Bortles would be ridiculous, and the coach is not happy to hear Bortles being booed the way he was on Sunday at EverBank Field. Of course it's ridiculous, the entire staff has hung their current employment on Bortles. And what the solution? Chad Henne? Bortles stats aren't great, but Henne's are worse. Yes, I said it. I said something positive about the Bork. He's better than Chad Henne. Anyway, I'm gonna try and find a video of The Walking Dead saying he "firmly, firmly" believes in Bortles so I can go all Lie To Me on it. tldr Saying "firmly" twice doesn't leave me hope he actually believes in him, but I can say he probably firmly, firmly believe Chad Henne would not be a better option. Lynch threw for 66% completion, 228 yards, 1 TD and 1 INT in that game. Could San Francisco please borrow him? Lynch threw for 68% completion, 228 yards, 1 TD and 1 INT in that game. Yeah, but on 35 attempts, against a frankly pretty lousy Atlanta pass defense. I mean, very possibly still an upgrade for SF, but, again, there is no compliment of any sort even vaguely implied to anyone involved in that statement. Look, going from Gabbert to Kaepernick was like going from completely starving to being handed 1/4 of a can of Spam. I just want a whole can. Paxton Lynch at the moment is probably half a can of Spam, and that can has been sitting in the sun for a while. Meanwhile, Brock Osweiler is a can of generic-brand potted meat food product. SF would be happy with Browns QBs at this point.